I was bound and determined to ride Gemmie last night. It was gorgeous out, dry and the best part? Daylight! Except then I saw someone fishing on our pond and had to go talk to them and let them know we bought the place and it wasn’t ok to trespass. See, we need a perimeter fence. I’m thinking 20 foot tall razor wire. Too much? Then Wyatt wanted to ride which I’ll never say no to. I had to put the new bridle together which took way too long to figure out. Those pieces were so small! He looked super sharp in his new pad and bridle though so it was worth the effort. By the time he was done riding it was pitch black and I lost motivation to tack Gem up by that point. Instead I just hopped on Nash. In Wyatt’s 14″ saddle. It was a tight squeeze. If you all thought I was bad at taking pictures, look at any from the Hubby. They are all either blurry or out of center. It was my first official ride on Nash and he was a snot. Nothing terribly bad but he took a bit to convince that I did mean what I asked for. He walked great and halted with the barest breath, two very important things with Wyatt, and really wasn’t that bad. But when it came to trotting….yeah I couldn’t get him to do it. I think I got one or two steps total. And my legs were killing me from pony club kicking the crap out of him. Ugh. I think most of it was the saddle. I couldn’t really ask well and the first time he finally did trot I was so out of balance in the tiny saddle and super short stirrups. As soon as he felt my balance off he slammed to a halt, again just what I want for Wyatt, and then refused to trot again. So it’s a work in progress. His canter looks amazing and I really really wanted to ride it. I may need to get a crop. I’m hoping that once I get in my own saddle and work with him more that he goes a lot better. If not he will earn himself a ticket to boot camp, but I don’t think it will be necessary. Smile for the camera Nash! He is a fun little guy and he is smart. Even when he was being a snot I just laughed. I have no fear with him and while I don’t think it’s good for me to ride him too much or too hard due to size I do think he is a huge confidence booster even for me. We will see what all we accomplish in the future, but I really want to do w/t/c and maybe some 18″ jumps with him. He should be ok with me on him for that. As for Wyatt he is dealing with his own fear issues and getting better every time. Nash stops so well and takes so much effort to go above a walk that he has no real risk of getting run off with. Wyatt’s biggest issue is that he is 5 and everything he does is full force. He is really hard on Nash’s poor mouth and Nash responds by stopping and/or throwing his head around both things that frustrates Wyatt. Hopefully he learns to be easier on the reins soon. Otherwise he is enjoying walking around and is getting the hang of steering and stopping. He is so cute! Could Wyatt ride him in a bozel? Or something without a bit? Maybe he’d still feel secure having reins to pull on? I just had this conversation with the hubby last night before bed. I was thinking a nice hackamore might work out well to give his mouth a break but still give Wyatt control. Nash stops if you even think the word, so I’m not worried about breaks at all. More horse shopping!!! Oh, oh, or a side pull beta biothane bridle in NEON GREEN! 😉 I know two horse tack has one and their stuff is pretty damn affordable. Oh! That’s a good idea too. Easier to keep clean as well. Hmmm…. 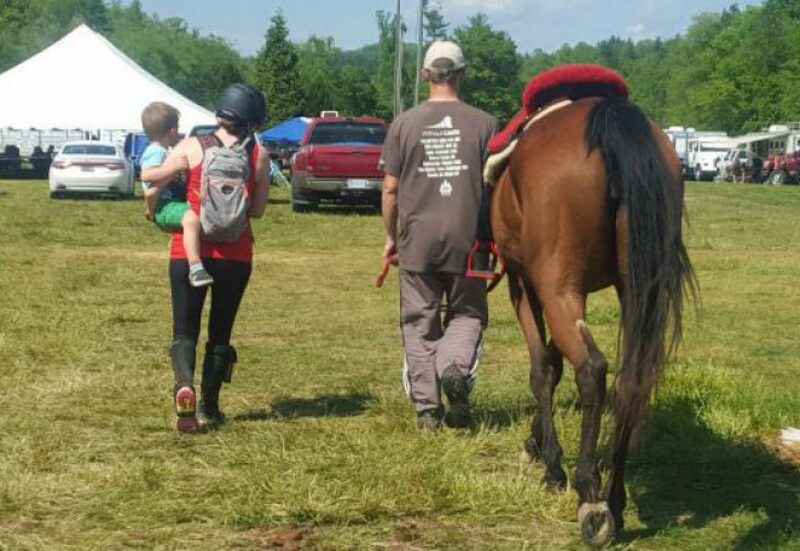 I like Emma’s idea of something without a bit- when my kids hop on P (sadly neither have expressed interest in a pony) I don’t let them have control of the reins because YIKES. Nash may not be perfect but he is awesome with Wyatt. He leads him in from and back out to pasture every day and accepts his big hugs. Razorwire might be much lol but a peacock might do the trick! Nash is so cute! Guineas! My husband calls them the devil’s birds! Loud and definitely will alert to strangers. Here in Texas, we can paint posts a specific shade of purple, which is marking a “No Trespassing” area, maybe works there too? I keep jokingly asking my husband if I can shoot trespassers (I don’t like people except “my” people); he says I’m not allowed to. Glad you’re going to try him in a hack! I bet that will make Nash AND Wyatt happy! Right now we’re still lead lining/ponying and I spoke to my pony’s previous owner, and she said she rode him only in a hackamore. SCORE! Hack it is! I love ponies that take good care of “their” kids. Makes them invaluable! The previous owners were friendly, happy people who let those who live around the property use it. Yeah..not me. So it is more educating those around us that the rules have changed than anything else. The first barn we boarded at here in SC had peacocks across the street. They sounded like little old ladies screaming for help. That would drive me crazy! Ya something without a bit would probably be good for now. Bummer about the trespassing. Better get some no trespassing signs. Also, interesting fact…I do not know if y’all have something up there like this, but down here if you paint the tops of your posts purple, it means no hunting and no trespassing. Someone else down your way also commented on that. I need to look that up. Haven’t heard of that before. I’m ordering him a hack. Should make everyone happier. No, I wish I did know someone with a little girl in need of a pony to ride. Honestly though Nash does what I bought him for: let Wyatt handle him on the ground and cart him around on the lead. Everything else is just icing on the cake. Omgosh I just adore his little pony face! That’s so great that he’s so inclined to be slow and steady haha. re: razor wire- my old boss and I used to discuss putting in a mine field in the driveway. You would just hit a button to activate it once you were inside the perimeter. Problem solved!!! YES!!! Dusty is way too nice for that to fly though.